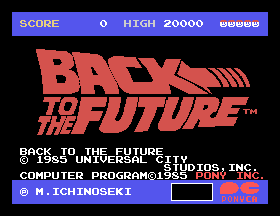 Play Back to the Future online with MSX browser emulation for free! Back to the Future (MSX) game rom is loaded with features in our flash, java and rgr plugin emulators. Nothing to configure, we've done it for you! In Back to the Future, 80s teen Marty McFly is mistakenly send 30 years into the past where he disrupts his own parents from meeting. Faced with extinction at the hands of a temporal paradox, Marty must find a way to reunite his future parents and make it back to his own time.LJN's game differs completely from the computer versions, and plays as a literal race against time broken up by brief arcade minigames. 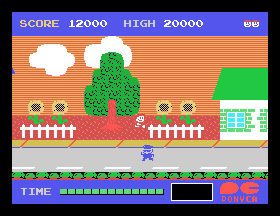 In the main game, the player controls Marty in an overhead view as he runs down the streets of 1950s Hill Valley. A collection of period-appropriate bad guys block his path, including bullies, hula hoop girls, bumblebees, and park benches. The camera scrolls forward at a fixed speed, so the player must keep Marty on the move and away from obstacles. Hitting one causes Marty to fall and lose a life. The player must also collect clocks scattered on the street to stop Marty's photograph from fading away. If it fades completely, Marty is erased from existence.Street running sections lead to three minigames. In these, Marty must sling milkshakes at oncoming bullies, deflect kisses (shown as hearts) from his mother, and collect notes to rock out on stage at the high school dance. The final stage resembles the street sections, as the player must control the DeLorean time machine and collect enough energy to travel through time (shown as lightning bolts instead of clocks). Review of this game is so going up on my channel jakethelightninghog. i cant believe its even more unplayable then the nes version!!! !